Youth shooting silhouette targets provides immediate feedback on success! Why shoot reactive targets? Well, man does not live by shooting paper targets alone, and we can’t always hunt. While it’s satisfying to shoot little groups in paper, for sheer fun, nothing beats ringing a gong at any distance, or sending a silhouette flying off a rail. Paper targets also don’t work well when the wind is howling or rain is falling. Steel functions no matter what the weather. Reactive targets also provide ‘instant gratification’ and success – immediate confirmation of a hit. That definitely enhances the shooting experience, especially with new shooters. Reactive targets are ideal when it is impractical to send people downrange to replace or score. In 4-H, shooting steel silhouettes is a common activity. On the archery range, balloons provide the reaction when the child’s arrow makes the balloon pop! Depending on whether you or your group is shooting air-rifle, small-bore or muzzle loaders, reactive steel targets can be made or purchased in the appropriate configuration depending on distance and projectile kinetic energy delivered. 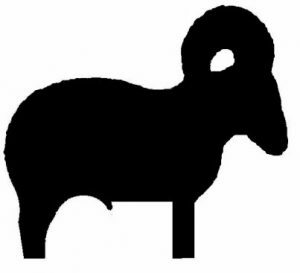 For example, shooting air-rifle pellets at a life sized 1/2 inch thick ram silhouette at 10 meters would not to be too much fun or challenge. A more appropriate target would be a thinner, smaller target to have a reaction when the pellet hits its mark. 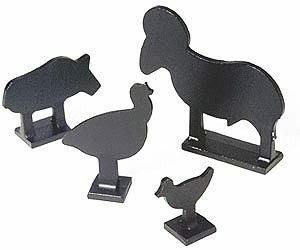 Silhouette targets can be cut from various types of steel. It has been found that low strength steels and some high strength steels are not satisfactory, because of the extreme damage done to them by high velocity bullets. For High Power Rifle, Black Powder Cartridge Rifle and Long Range Pistol targets, abrasion resistant alloy steels should be used. For Small-bore Rifle it is not necessary to use the harder steels. For Hunter’s Pistol, it is suggested that the harder steels be used for the closer targets. T-1 steel is required for Hunter’s Pistol chickens. The “feet” upon which the silhouettes rest should be of the same type of steel as the rest of the target. Silhouettes are set on stands which should be, if possible, two to three feet from the ground so that they can fall free of the stand when hit. Silhouette need not be painted black if another color makes them more visible. On some ranges, targets are painted white or even blaze orange. Follows are the NRA guidelines for target size with differing calibers of rifles. Reactive targets in this article are referring to “passively reactive”, i.e, they fall over. The primary safety concern is a ricocheting bullet. In Florida 4-H for .22 rimfire and muzzle loading rifles the safe distance is 50 yards. In air rifle, the safe distance is much less, due to the lack of sustained energy of the pellet. One can safely shoot pellet rifles at silhouette targets at 10 yards. Another type of reactive target, that I call “actively reactive”, has a powder charge or secondary mechanically or explosive action. These should not be used, and may not be used in any 4-H youth shooting sports program. The National Rifle Association rules allow for reduced distance firing provided the targets are reduced proportionately to the distances used. This provision was put into the rules in order to allow those clubs which cannot attain the longer distances to have a silhouette program. If desired, all targets can be set at one minimum distance, such as 200 yards in High Power Rifle. The minimum allowed distances at which reduced courses can be fired are: High Power and Black Powder Cartridge Rifle, 200 yards; Long Range Pistol, 50 yards; Hunter’s Pistol, 40 yards, and Small-bore Rifle, 40 yards. Muzzle loading rifles and pistols should also keep similarly safe distances. One exception may be with silhouette spinning targets that may be shot as near as 25 yards with muzzleloaders and 10 yards with air-rifles. Lead splatter and ricochets beyond the target backstop are the primary safety concerns. We shoot lever action smallbore and pistol cartridge rifle metallic silhouette at Seminole County Gun and archery and Chuluota Sportsmans Club on second Saturday and second Sunday of each month. Also smallbore and Hunters Pistol at Chuluota SC.